Summer is here, and light clothing abounds! I’ve lost some weight so I used it as an excuse to pick up some lighter weight tops. All of the tops and sweaters listed below come in under 5 oz (140 g) each. They are made out of linen knit, so don’t crumple up like woven linen. I sink washed each of them and can guarantee that they dry quickly without wrinkles. Now you too can laugh at airline weight limits. Many of these items are going on sale. This is a classic tee that is loose and comfortable. It weighs in at 4.15 oz (117 g). 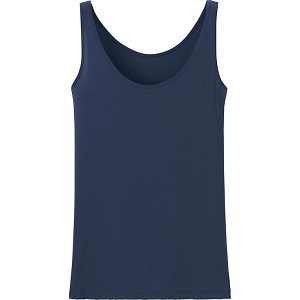 The Gap tee is lighter weight than the Old Navy tee. It weighs in at 3.55 oz (101 g). I needed to wear a beige color bra underneath it. This tee comes in a very wide variety of colors. 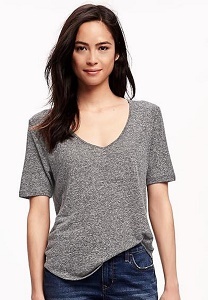 The Gap also has several other linen items, including V-neck pullovers and sweaters. This was my first Airism purchase, and I’m fairly impressed! The top is very light and soft. It makes a great layer under a see through sweater or top. It weighs in at 2.3 oz (65 g) and comes in several colors. This cardigan is very, very, very light. It is also very translucent! The sweater rolls up very small and will easily fit into your purse. It works well for air conditioned buildings. I wasn’t impressed with the quality. I’ve already had to fix a seam that blew out the first time I wore it. The cardigan weighs in at a mere 4.55 oz (129).